CHROMA is a revolutionary lighting control application. The user interface has been tailored to encourage novice designers to experiment with confidence and allow experienced designers to move with unprecedented speed. Entering your lighting cues in the script just feels natural with the ability to easily control intelligent fixtures along with conventional lighting, CHROMA makes Lighting Design a joy. The script based cueing system used by CHROMA and the rest of the StageSoft Production suite makes cue entry and show creation a breeze! Entering your lighting cues in the script just feels natural, no more writing and updating cues in a prompt book or script. Having the script always available and always in the correct spot make it easy to communicate with the rest of the creative team. “get out of the booth!”Wouldn’t be nice to be able to walk around the room and adjust your lighting? CHROMA allows you to get out of the booth! You can design and run the show from anywhere in the house. This is possible because all of the StageSoft applications are connected through the CUE SERVER, and the “DMX playback engines” can run separately from the CHROMA design app. The CUE SERVER application keeps track of all the cues in the show. It communicates with all the other StageSoft applications updating the current line as it changes and helps coordinate the execution of each and every cue. 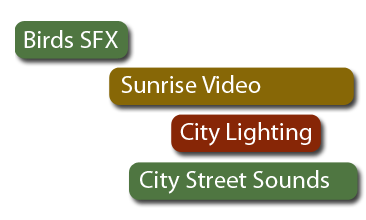 StageSoft allows you to link any Cue; sound, light or video to any other Cue, allowing you to create complex sequences of cues that would have been almost impossible to create without thousands of dollars in equipment and highly trained operators. 0.3 seconds after the birds sound effect ends start the city morning lighting cue. Sequences like this are easy to create, manage, and consistently execute using StageSoft. 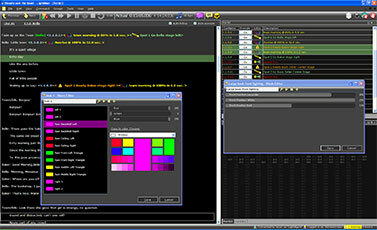 CHROMA can create and manage an unlimited number of presets or as CHROMA calls them “Blocks”. Blocks can be stacked to create larger more complex blocks. Special editors are included to help with moving head and Color mixing fixtures. If the Director wants an actor to stand 5 ft to the left, just update the “position” block, and the changes are instantly reflected in all relevant cues. “Rehearsals just got easier with CHROMA” When the director wants to jump to a certain line in the show, just “double click” on the correct line in the script and all of the applications will instantly be ready to continue from that spot. Want to restore the lighting to the current line? Just press [F8] and CHROMA will instantly restore all channels to the correct values. Try doing that with a conventional dimmer board! Rehearsals just got easier with CHROMA. Intuitive building of reusable and customizable lighting looks. Easily name your channels and looks. Ability to control intelligent fixtures and color mixing lights. Synchronize with audio tracks using tap tempo. Complete integration and consistent user interface across all StageSoft products. Create custom blocks and then use those blocks to create more complex blocks. Blocks support Preview, Keywords, Undo, and Duplicate. RGB pallete tools make it easy to create beautiful scenes. Built-in color suggestion control allows selection of a primary color and will show you complementary colors and shades. Support for multiple DMX Universes. Keywords: Keep things organized. Quickly find and reuse blocks. Includes a powerful animation engine with tap tempo. Create animations (chases) using any blocks or combinations of blocks. Use MIDI based control surfaces to help speed design work. Generate reports to show how many blocks are using output channels to maximize efficiency.